Alessandra Cirelli is a Museum Management and Curatorship student at Fleming College and this summer she completed her placement with the RMG. During my undergrad, I completed a degree in art history and fine art, but when I finished I had that nagging question that most students have—what do I do now? I knew I wanted to work in an art gallery, but felt I needed the skills to do so. So back to school I went, to become a Museum Management and Curatorship student at Fleming College, a one-year program with a 14-week internship. There, I studied how to preserve and catalogue art, artifacts, and manage the daily operations of a Museum and Art Gallery institution. I learnt more than I could have ever imagined about the inner workings of a Museum and Art Gallery. The school year flew by and at the end of my second semester it was time for my internship. I changed my one-hour commute to Fleming College in Peterborough into a welcomed ten-minute drive to The Robert McLaughlin gallery where I spent the summer as a curatorial intern. During my internship, I experienced a bit of everything, from cataloguing and rehousing photographic collections, helping create exhibition proposals, photographing and reorganizing the sculpture collection, I have been involved in it all. 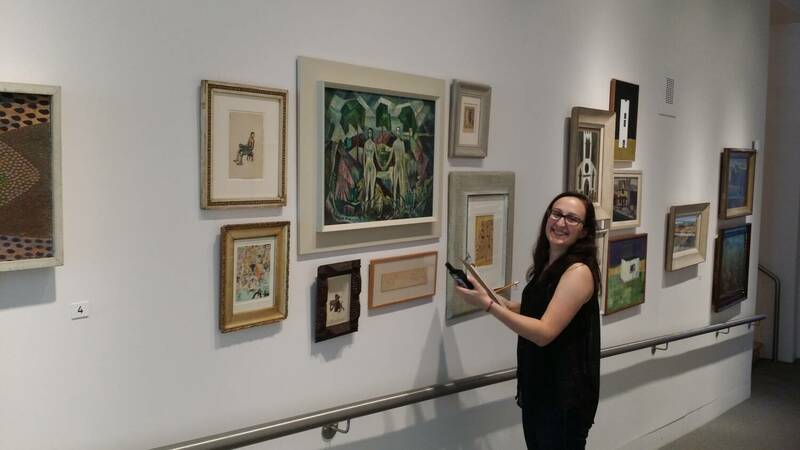 One of the many highlights of my internship was the chance to use my newly acquired artifact and artwork handling skills to take down and install new exhibitions. It was a proud moment seeing the loading dock full of multi coloured crates filled with artworks I helped pack and wrap waiting to be shipped to the next exhibition. My main internship project was to reorganize and photograph the sculptures in the RMG’s sculpture collection. Sculptures were photographed using professional lighting equipment and Canon 5D camera. The pictures were then uploaded to the RMG’s online database for both internal use and, if copyright allowed, for the public to see and enjoy. After photographing, I reorganized and assigned locations to the sculptures in the vault. As good practice, each object should be locatable within 3-5 minutes and should be accessible by moving only one to two items to get to it. By reorganizing and assigning locations, the sculptures in the RMG’s sculpture vault are now more accessible for research and exhibition preparation. I have learnt a great deal at the RMG, I now feel like I have the knowledge and the skills to work in a Museum or Art Institution. I extend a huge thank you to everyone here at the RMG for making me feel like a part of the team during my 14-week internship.